If you’re looking for a way to freshen up your kitchen without completely remodeling, changing your kitchen faucet might just do the trick. A pull down kitchen faucet not only looks fresh and modern, it actually makes your sink more versatile. We’ve researched a variety of best faucets brands around to help you find the right one for you. Finish Type - Polished? Oiled? Brushed? What about black matte? 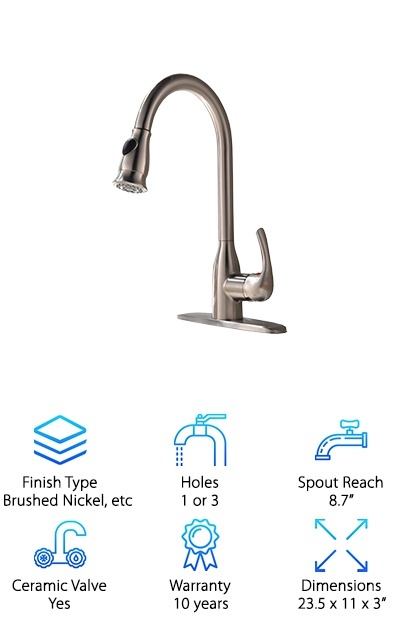 Whatever finish you prefer, there’s a pull down kitchen faucet for you. Each has their own benefits and will add a distinctly different look to your kitchen. Holes - Pull down kitchen faucets are all made for 1 hole installation because they don’t have separate hot and cold handles. If you have a 3 hole sink, don’t worry! All you need is a baseplate to easily adapt for a 3 hole installation. Spout Reach - This is the distance from the center of the spout to the water flow. Make sure this hits the middle of your sink! If not, you’ll either have a hard time using it or it will overshoot the sink edge. Ceramic Valve - A ceramic valve consists of 2 ceramic discs - one that’s stationary and one that isn’t. The move against each other to control flow. So, what doesn’t that mean? Less leaks and less maintenance for you. Warranty - Obviously, the longer the warranty, the better. Some of the best kitchen faucets brands even come with a lifetime warranty! Make sure you read the fine print so you know what’s covered. 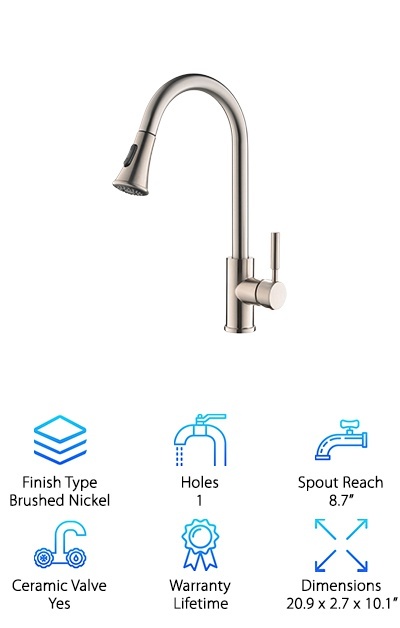 Dimensions - It’s a little tricky to provide consistent dimensions because every faucet is so unique. The easiest way to compare sizes is to look at the overall height, length, and width of the faucets. 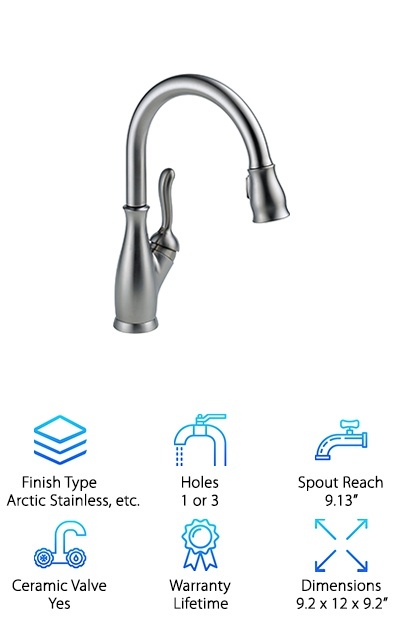 If your method of choosing one of the best pull down kitchen faucets consists of only searching for Glacier Bay faucets reviews, have we got a surprise for you. Now that you know the features to look for, finding the right pull down faucet will be so much easier. Let’s take a look at some of the best pull down faucets. In a hurry? Our best pick and top rated pull down kitchen faucets are a good place to start. For a perfect blend of traditional looks and modern technology, the Delta Kitchen Faucet is our Top Pick. Its sleek design comes in three different finishes. It fits in with any style decor. A powerful magnet holds the wand in place when it’s not in use. Guess what else? There are two spray functions: spray and stream. The holes are easy to clean with Delta’s Touch-Clean technology. What is Touch-Clean technology? You can clear calcium and lime build up from the soft rubber holes with the touch of a finger. Mounting is easy with the Duramount mounting system, which features a diamond-embedded ceramic disc. And check this out. It’s also available with Touch20 technology so you can turn on your faucet with just the touch of your hand. This Comllen Kitchen Faucet gives you a sleek, modern look at a bargain price. The brushed nickel finish is for more than looks. It will also help it resist tarnish and corrosion. This faucet provides a lot of clearance so you’ll have no problem washing large pots. That said, the sprayer has superior movement and is easy to use so you can also delicately clean your fruits and vegetables using either a stream or spray option. Another good thing? The water pressure is great whether you’re using hot or cold water. Everything you need to install it is included so no need to worry about last minute trips to the hardware store. Just get busy installing your awesome new faucet. One thing - there’s no baseplate with this one. If you’re looking for a way to get a commercial style look into your kitchen, check this out. 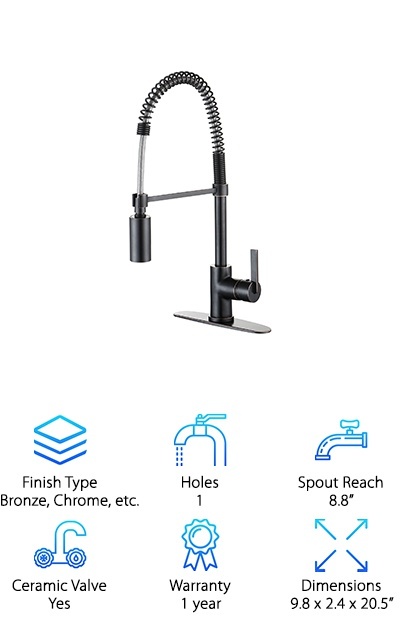 This industrial looking faucet will add a lot of interest to your sink. It’s made of lead-free brass. What does that mean for you? Maximum durability. The sprayer has a simple one touch system for temperature and flow control. You can switch between a gentle spout and a more powerful pre-rinse. An aerator makes sure that you get enough water pressure while using less water. Plus, rubber nozzles prevent calcium and lime buildup so the water flow will stay consistent as time goes on. The open-style coil spout swivels a full 360 degrees so you can reach every part of the sink. What else? All the mounting hardware is included. The American Standard is considered a best brand of kitchen faucet. This design is classic and modern looking. No commercial looking coils here. This sleek finish resists any scratching and tarnishing. What does that mean? It will stay looking good for a long time. The design is made of brass in part because it holds onto the coating really well. Brass also has natural corrosion resistance so it won’t rust over time. The pull-down sprayer not only has adjustable spray patterns. It also features a pause feature so you can stop the water without actually turning off the faucet. This helps you make sure you get the water where you want it and only where you want it. The one hole design can be mounted with or without a baseplate. For a different take on an industrial modern design, the Enzo Rodi faucet deserves a closer look. The coil design is an eye catching feature and they’ve done it very well. The pull down spout and 360 degree swivel mean that you can reach all corners of your sink. The spout has simple controls: two easy to use buttons that let you switch between stream and spray modes. Rubber holes prevent lime build up that can slow down water flow over time. Maintenance is easy! All you have to do is wipe it off. 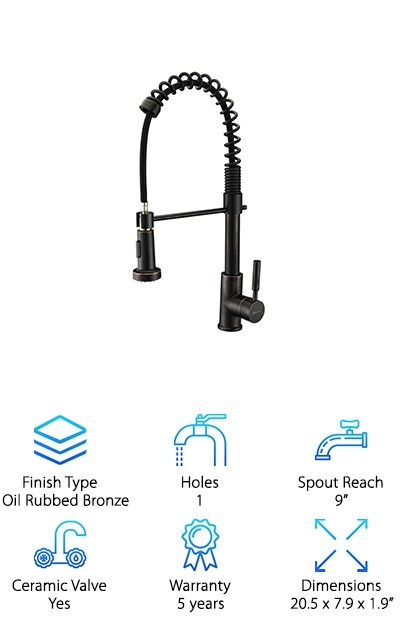 You can use 1 or 3 hole installation with this faucet pretty easily. Why? Because it comes with a baseplate. There are 4 different finishes to choose from so you’ll easily be able to match your other appliances. 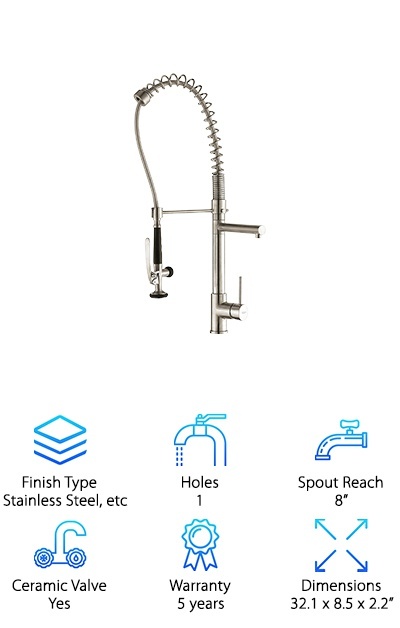 Not only is the KINGO HOME Pull Down faucet nice to look at, it’s also strong and durable. The finish resists corrosion and tarnishing. The brass construction protects the inside of the faucet from any rust and corrosion, too. What does that mean for you? 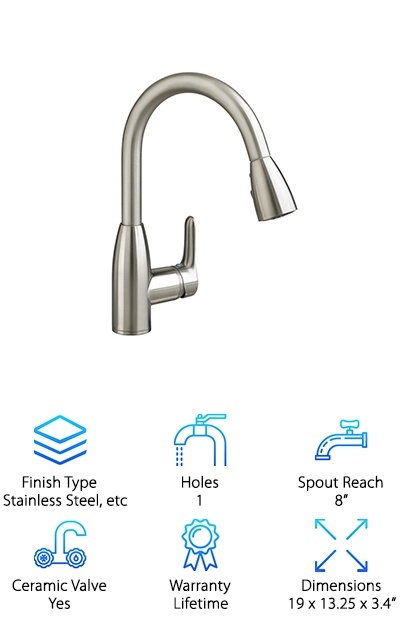 A long lasting faucet that will stay looking new. The high arch spout and 360 degree rotation mean you can reach every corner of the sink. The spray head itself has 2 functions, stream and sweep. The rubber nozzle prevents hard water buildup and is a cinch to clean. This sprayer covers a lot of ground. How? Because the flexible hose is 20” long. Ergonomically designed buttons make this faucet really simple to use. And guess what else? All of the installation hardware is included. When it comes to something like a faucet that’s in contact with water constantly, materials matter. GICASA understands this. GICASA faucets are made to last. What makes them so durable? They’re made from only the highest grade brass, minimizing the risk for any corrosion and rust. No addition finish added to this one. The bronze is oil rubbed for a dark, old world look. You can get the spout everywhere you need it to be thanks to the 360 degree swivel. A single button on the spout controls water output, switching between spray and stream modes. GICASA shows its commitment to its customers by taking their suggestions to heart. They’ve improved the quality of this faucet by removing any plastic parts involved in installation. A beautiful faucet from a company who listens. 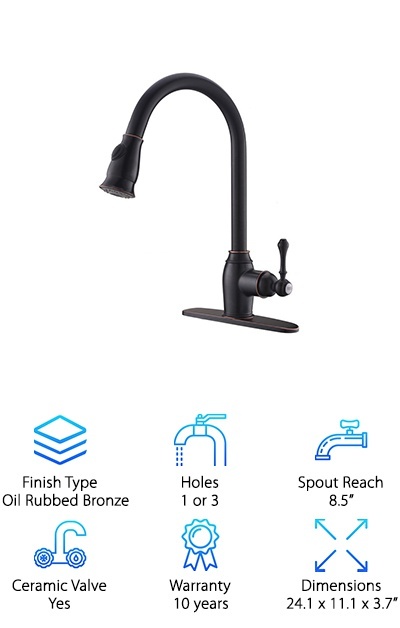 The oil rubbed bronze finish on this pull down faucet from Ufaucet is not only beautiful. It’s also extremely durable and resists corrosion and scratches, too. And check this out: the high arched, 360 degree swivel means there’s a lot of room for pots, pans, and whatever else you need to clean in your sink. It comes with a matching baseplate, good news for anyone who has a 3 hole sink. No need to buy one separately which will save you time and a little bit of money. Ufaucet tests the water pressure for its products to make sure it stays consistent. What does that mean for you? Reliable, high quality durability. And, as an added bonus, installation is a piece of cake thanks to the included installation tool. A crisp, clean looking addition to any kitchen, this pull down kitchen faucet from Hotis works with a range of decorating styles. It also comes in brushed nickel and chrome so you can match it to your other appliances. That’s not all. It also adheres to strict water saving standards. The water is fed through the spout in a way that makes sure you get the same amount of pressure using less water. The solid brass construction resists corrosion and means you’ll get long lasting, consistent performance from this faucet. The high spout and long pull out hose give you a lot of room for your dishes. It also comes with a base plate so you can easily install it in sinks with 1 or 3 holes. 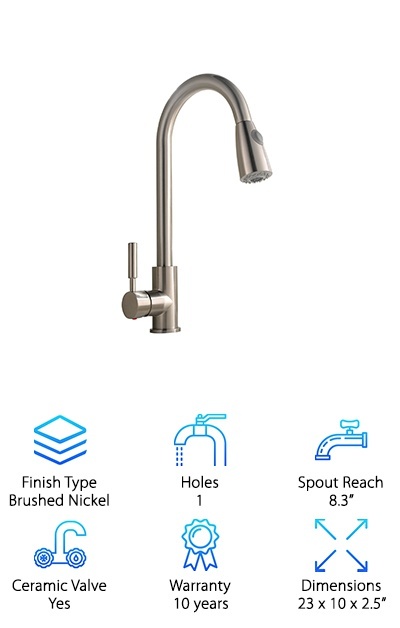 This Purelux faucet has the perfect height and hose length so you can naturally work at your sink without any uncomfortable bending or leaning. 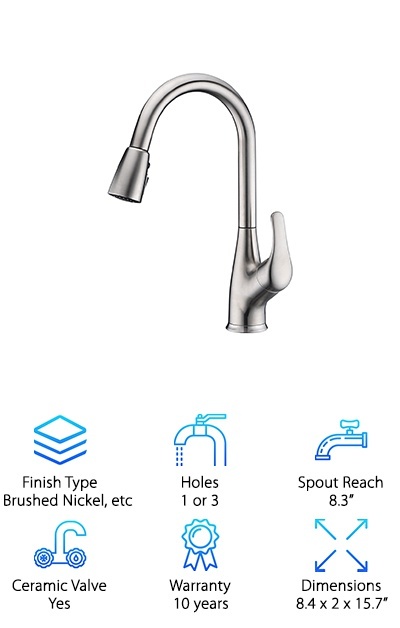 The spout rotates a full 360 degrees so that you can reach any corner of the sink or, if you need to, move the faucet out of the way altogether. This spray head has three functions. Choose between a spray or aerated water stream or use the convenient pause feature. This allows you to stop the flow without actually having to turn of the water. You can move the nozzle around without having to worry about getting water everywhere by simply holding down the pause button. This makes the spout surprisingly versatile as you can do a variety of tasks without worrying about getting water everywhere.